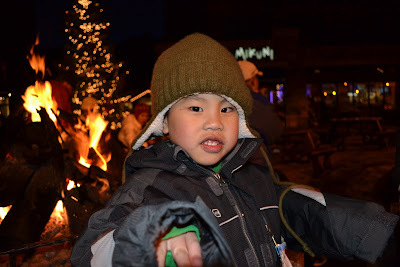 The holidays are upon us, and Irene and I are busying ourselves with family and travel. We hope we've left you well-equipped to survive the holidays with a bit of inspiration, a few recipe ideas, and a healthy dose of good tidings and cheer to last you through the new year. The wait was worth it. 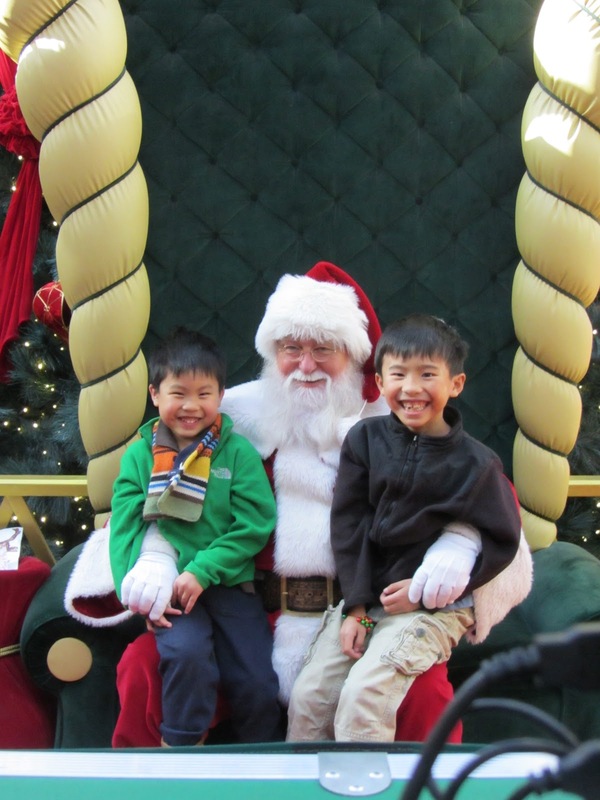 Santa deciphered every Batman and Star Wars Lego item on the boys' lists (and got a good chuckle over Addi's request for a pink scooter and chocolate ice cream!). 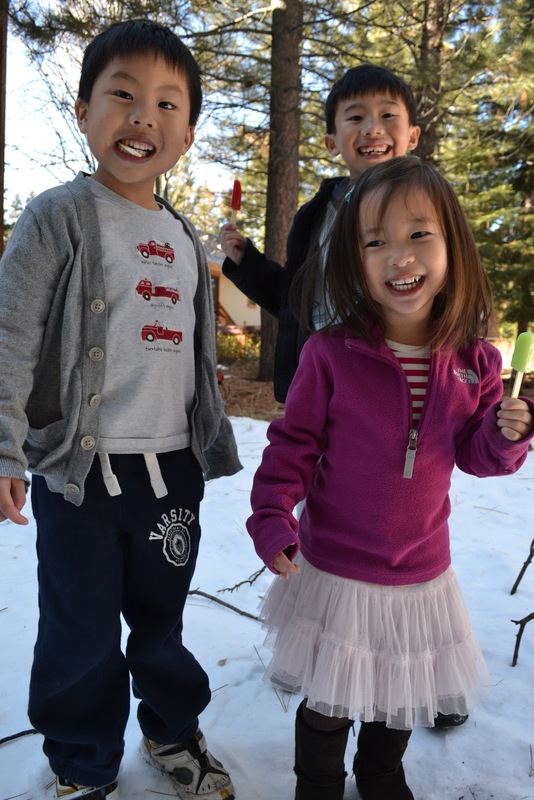 and eat popsicles in the snow! ﻿We hope you're enjoying quality time with the kiddies as much as we are! Until we meet again--in 2012--Happy Holidays from our Get Allergy Wise families to yours! On the last school day before winter break, Ryken's class had a party which celebrated the many holidays and cultures that are represented in their class. I boiled some good old Ling-Ling potstickers to introduce the kids to a food shared at Chinese New Year. Being that my son is in a Spanish bilingual school, the overwhelming type of party food was Mexican. There were tamales, taquitos, and buñuelos alongside American party food like pizza and cookies. It was quite a spread! As the foods contained milk or cheese, Ryken wasn't able to try any of the Mexican foods. (He did eat some safe Trader Joe's taquitos and a ton of potstickers!) It was too bad because the making and sharing of these foods is in integral part of the holidays just as noodles, dumplings, and special dishes are to Chinese New Year. Tamales, especially, are popular at Christmas time, perhaps, because they are too labor-intensive to do on a regular basis. In our effort to educate ourselves with Mexican culture and in a self-serving attempt to get my Mexican food fix safely (seriously, I love tamales! ), I decided to go for it and make tamales with the kids. I made sure to have a couple of children's books available for my little chefs before or after the tamales were done. Too Many Tamales by Gary Soto and Growing Up with Tamales by Gwendolyn Zepeda are excellent picture books that spotlight the importance of tamale-making for families at Christmas time. They are both warm family stories that remind kids of the steps and love needed to make the tamales. We visited a local Mexican market for the corn husks and masa harina (corn flour) although I'm pretty sure I've seen both at some bigger chain supermarkets. Soak corn husks in a large pot of water for at least 10 minutes. Keep as many husks in water until you are just about to use then. For the dough: combine wet and dry ingredients thoroughly. Mix until masa mixture feels fluffy and light. For fillings: mix each filling's set of ingredients until evenly mixed. Prepare a large stockpot with a couple inches of water and a steamer basket. Make sure you aren't adding more water than the height of your steamer. Tear 1/2-inch strips of corn husk to use as ties for your tamales. You may want to sift through your husks and use small corn husks for the ties to save the larger one for making tamales. 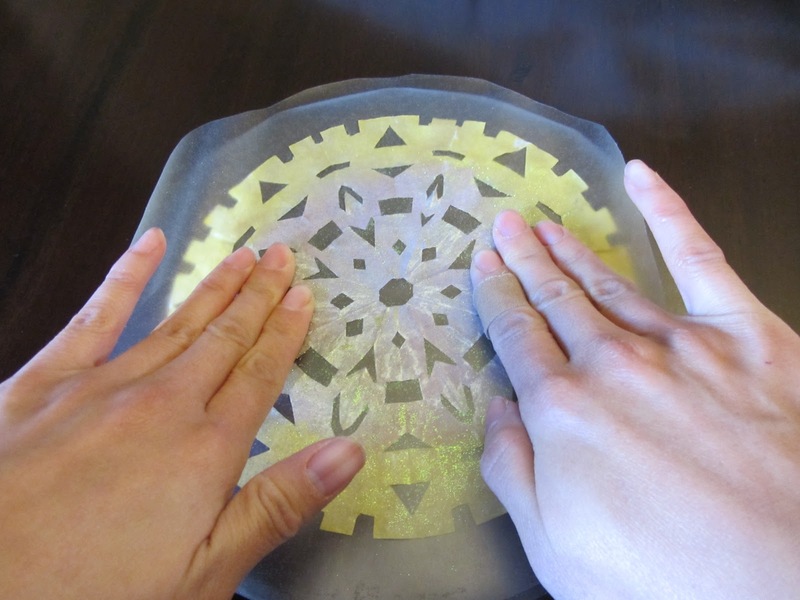 Spread out one corn husk flat on your plate or work surface with more narrow, pointed side facing down, closest to you. Spoon 2 to 3 tablespoons of dough in the center of the husk (it really depends on how big or small your corn husk is). Flatten dough into a rectangle shape leaving an inch of husk around the left and right sides and a couple inches along the top and bottom. We used our hands to do this. Spread a generous tablespoon of filling in the center of the dough rectangle. Use two husk strips to tie top and bottom of tamales closed. Add a layer of corn husks to the bottom of the stockpot/steamer basket. Put one layer of tamales on top of the husks, then cover with a layer of corn husks. Repeat as many layers of tamales and corn husks as can fit in the pot. Securing place the lid on top to retain steam. Steam tamales over medium heat for at least 30 minutes until tamales harden. While this was a multi-step process, fillings can be prepped in advance. I really liked using Trader Joe's already cooked "beefless" veggie faux meat. I imagine it saved me a few steps! Rotisserie chicken like Costco's would also make a good, ready-to-use meat in the filling recipe. My first grader was able to spread the dough and filling for several tamales before getting bored or frustrated. 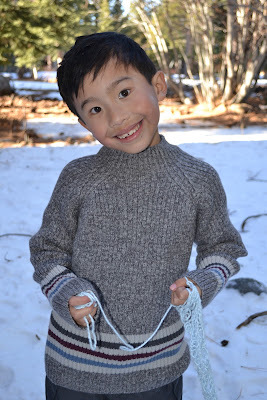 (I tied them all shut.) Overall, the tamales did take time but, just like what's shown in the books, this is a perfect activity to do around the kitchen table with family. I made approximately 40 tamales with the above ingredients and had some butternut squash filling left over. I thought both kinds of filling turned out well but the meatless meat filling was the big hit with kids and grownups alike. My husband said these tasted just like the real thing which was a nice compliment being that traditional tamales are often made with meat, lard, butter, and/or cheese. Whether you are making tamales, latkes, Chinese hot pot, or a Christmas ham, we at GetAllergyWise wish all of you and your family the safest and warmest holidays. 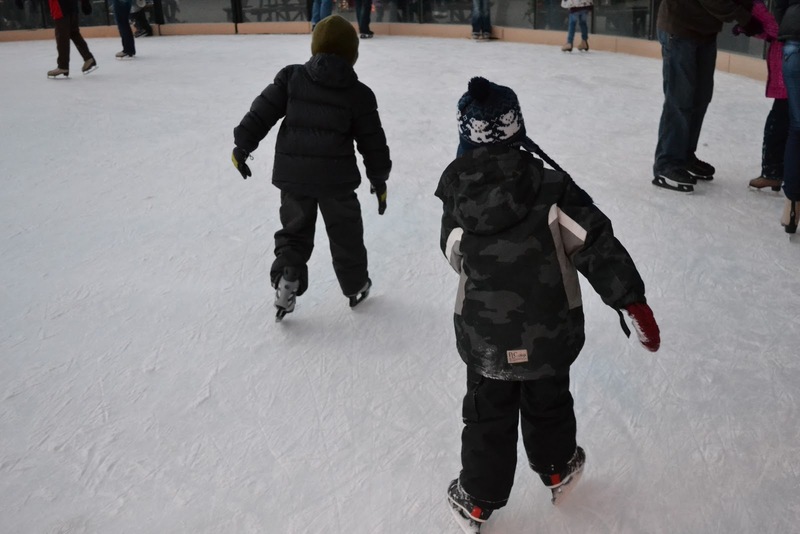 We will see you in 2012! If you're planning on making an elegant treat this holiday season, consider making cake truffles. The ingredients can be relatively simple -- your favorite cake, a batch of frosting of your choice, shortening and semisweet chocolate chips. While this is a three-step process -- baking, balling, dipping -- the tasks themselves are easy even if they are a bit time-consuming. Definitely get your kids' help in baking and decorating these bite-sized treats. My help gets paid in spoon-licking and taste-testing. You can make homemade cake and/or frosting or use a safe cake mix and ready-made frosting. To prevent chocolate overload --yes, there is such a thing, even for me -- I like to make my own cake and frosting so that I can reduce the overall sugar in the truffles. I reduced the sugar in the cake by 1/4 cup. Also, I made only a half-batch of frosting and used only half the powdered sugar that was called for in the recipe. You can certainly get away with changing the sugar amount since there is plenty of sweetness between the cake, frosting, and chocolate coating. Prepare your cake of choice as directed. Cool completely. In a large bowl, mash together cake and frosting. Combine completely. 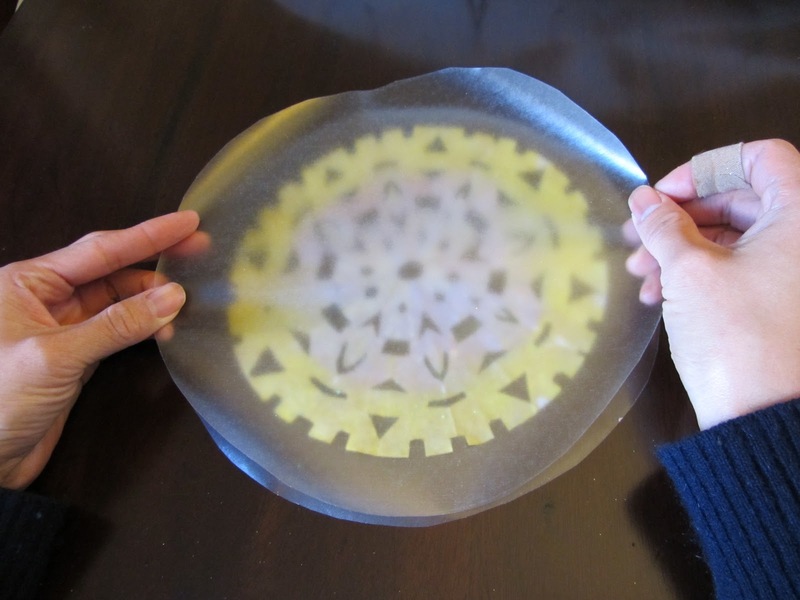 Line freezable cookie sheets or tupperware with parchment paper. Using your hands and possibly gloves (this is a messy dessert! ), form 1-inch balls out of the cake/frosting mixture. 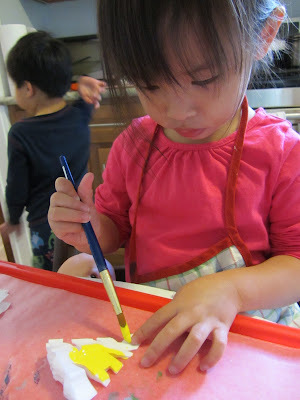 Place on parchment paper making sure balls do not touch each other. Freeze cake balls until hardened. Line jelly roll pan or cookie sheet with parchment paper. Open shakers of decorations or prepare small bowls with decorations and spoons. Set 1/4 cup of chocolate chips aside. Cook remaining chips and shortening in a double boiler over low heat. If you don't use a double boiler, put the chips and shortening in a glass bowl that sits in a pot of an inch or two of water, being careful that no water will bubble into the bowl. You can also microwave the chips and shortening for about 2 minutes, checking and stirring the chips every 30 seconds to prevent burning or seizing. Stir chips and shortening frequently over low heat until the mixture starts to melt. Stir until there are almost no lumps remaining in the bowl. Then turn off heat and add in remaining 1/4 cup of chips. Stir until melted and smooth. If coating is too thick, melt in more shortening. If it's too thin, melt in more chips. Take chilled balls out of freezer. Dip balls one by one into chocolate and rotate to thoroughly coat. I usually use two utensils -- a spoon and a crab fork with tiny tines -- for this. 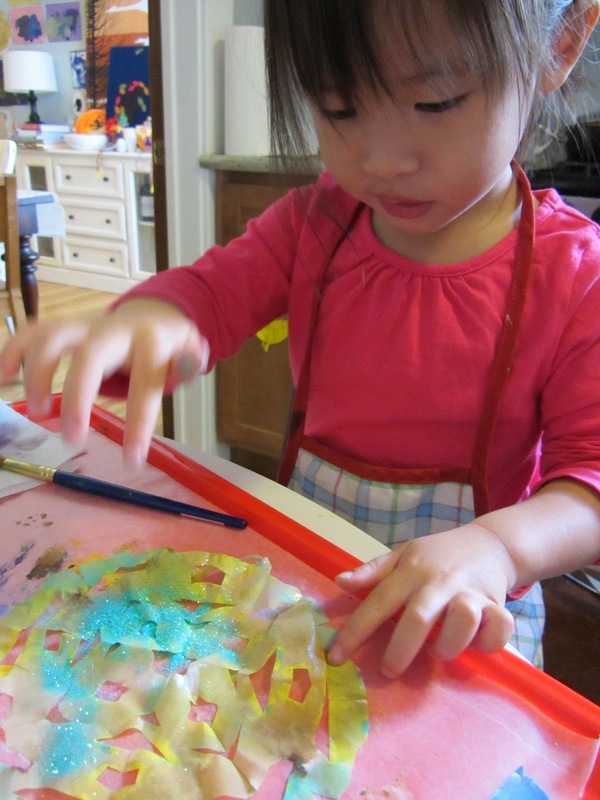 Place each coated ball on cookie sheet lined with parchment paper. Quickly sprinkle on decorations, crushed candy canes, or whatever your topping of choice before chocolate hardens. Be sure to space finished truffle balls so that none touch each other to prevent sticking. Refrigerate or freeze balls to help solidify the chocolate. After the coating has hardened, transfer truffles into airtight containers and keep in refrigerator until serving. Makes 2 to 3 dozen 1-inch truffles. I used the wacky cake recipe with a xanthan gum/gluten-free flour blend substitution. To "Christma-fy" my cake truffles, I added several drops of peppermint oil to the cake batter before baking and a few drops to the chocolate-shortening coating. (My advice is to add just a couple drops at a time and taste-test to achieve your desired mintyness.) If you are using peppermint extract, you will need more than a few drops to match the strength of the peppermint oil. The daughter of one of Ryken's teachers was recently diagnosed with Celiac Disease. I made the teachers these gluten-free chocolate truffles along with gluten-free chocolate crinkle cookies and cranberry chocolate cranberry biscotti using GF flour blend in recipes from the previously reviewed Vegan Cookies Invade Your Cookie Jar by Isa Chandra Moskowitz. When my kids and I attended the BJ Hom Jr. Memorial 5K and FAAN walk in October, we had a terrific time. The weather was gorgeous, there was music and a bounce house. We were able to meet new people and learn about some unique allergy-friendly businesses including Generation Allergy whose customizable allergy education videos were showcased at our Food Allergies Rock event. 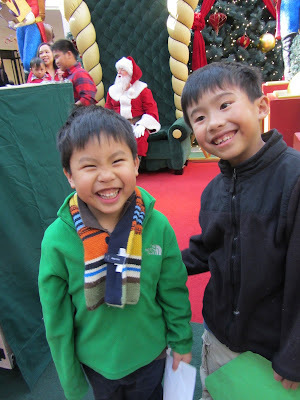 And of course, my milk- and nut-allergic boys were able to eat! There were so many tasty, safe snacks at the FAAN event that my boys really were like kids in a candy store. I was familiar with most of the walk sponsors like Dr. Lucy's Cookies and Sunbutter. However, one sponsor, HomeFree Treats, was brand new to me. HomeFree donated packs of mini chocolate chip cookies for the event. Being the chocoholics that we are, the kids and I opened these first before any other treat. 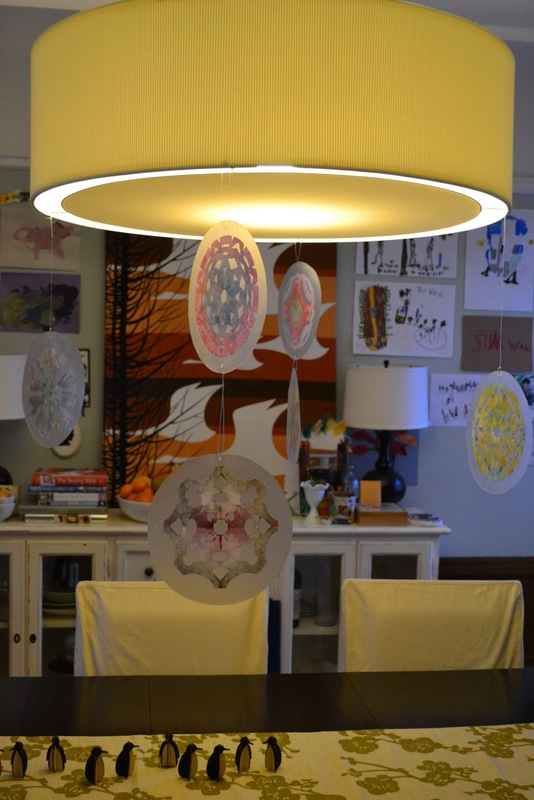 HomeFree Treats was begun by Jill Robbins, a clinical psychologist mom of a food-allergic child. Robbins understood first hand the impact on kids when they are excluded from birthday treats and other special occasion sweets due to their food allergies. Robbins was inspired to create delicious, wholesome products that can be enjoyed by most everyone. HomeFree products are made in a dedicated facility that is free from dairy, eggs, peanuts, tree nuts, and seeds as well as fish and shellfish. The facility was built for HomeFree from the ground up so none of the aforementioned allergens have ever come into their facility. The company takes pride in its stringent practices and their continued efforts to prevent cross contamination through frequent random testing for allergens. The vanilla mini cookie is the 2011 winner of Shape Magazine's award for Best Snack. HomeFree Treats are made with natural and organic ingredients. All products are free of dairy, eggs, peanuts, and tree nuts and cookies are available as gluten-free. In addition the vanilla mini-cookies and oatmeal cookies are soy-free while the soy in other HomeFree products is limited to soy lecithin. Mini cookies are sold in boxes of about 32 or in sets of 10 single-serving packs containing 6 cookies apiece. The single-sizes would be perfect additions to your child's school treat box for those unplanned class celebrations and parent-donated birthday cupcakes! We tried vanilla, chocolate chip, and chocolate chocolate chip -- all three delicious! Originating on the east coast, HomeFree is now making its way into California specialty stores such as Whole Foods Markets in Southern California and independent health food stores. Can't find them on your store's shelves? Talk to your store's manager about carrying HomeFree Treats and submit a written request form such as this. Customer requests can make a big impact on what products stores decide to sell. If they aren't yet in a store near you, HomeFree products including cookies, coffee cake, and cookbooks are available for purchase online on the company's website. 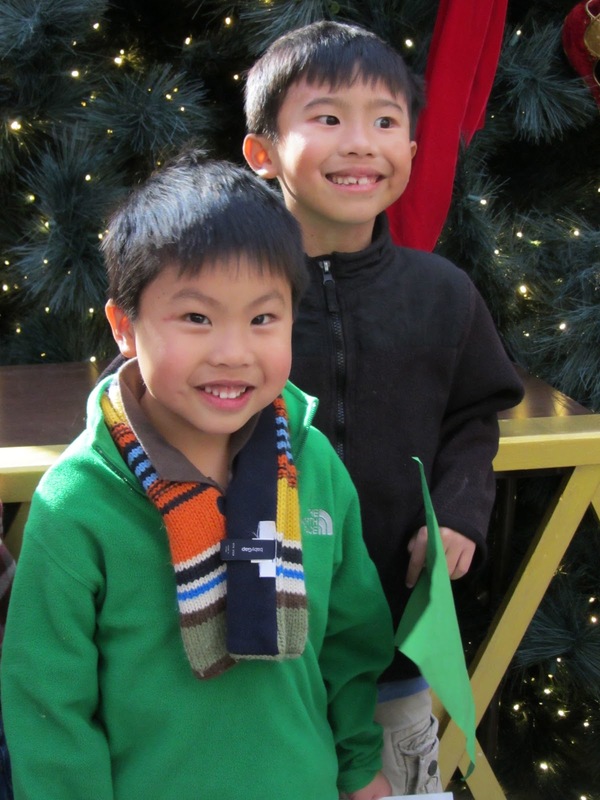 Consider putting them on your list of allergy-friendly gifts or stocking up on safe treats for this holiday season! Chocolate dipped pretzels are almost as easy to make as they are to eat. Looking for ideas for quick homemade thank-you gifts for the teachers in your lives? Make chocolate coating to dip and decorate pretzels, crackers, or your favorite safe snack. You can dip cookies (homemade or store-bought) for an easy way to dress them up for a special occasion. I only half-dip. It looks more elegant and it's a lot neater and easier! Dip foods one by one into chocolate mixture. 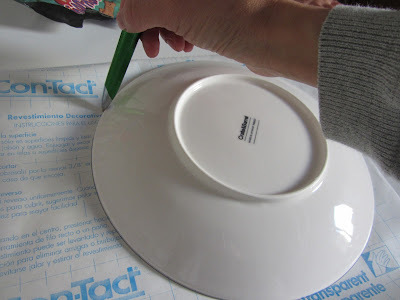 Place dipped items on a parchment-lined pan. Drizzle non-pareils, sprinkles, crushed candies or whatever your decoration of choice. Refrigerate for 15 minutes or until chocolate is completely hardened. Store in an airtight container in a cool place. I added peppermint oil to make the treats more festive. Experiment by pairing the chocolate coating with different salty snacks. I dipped some tortilla chips in an effort to use up some excess coating and thus created an interesting new gluten-free treat! Tortilla rounds look lovely after dipping. Not too lovely for devouring! You can also drizzle the melted chocolate over snack foods. This works well with popcorn. Again, refrigerate until chocolate is hardened. Break the popcorn into small pieces and store airtight in a cool place. Enjoy making these treats and try to save some for your intended recipients! Okay, so I went a bit crazy with the holiday decorations this year. The tree, the lights, the ornaments, the stockings hung by the chimney with care...oh, I just love how festive it feels! And because we started everything on Thanksgiving weekend, we get to enjoy it for at least a full month! Some may say I'm overcompensating for not letting the kids make gingerbread houses because of well, the candy, the sticky, the houses that will take up my only remaining clear tabletop space and will induce a fountain of tears when it comes time to throw them away (or when the ant colony moves in, whichever comes first). 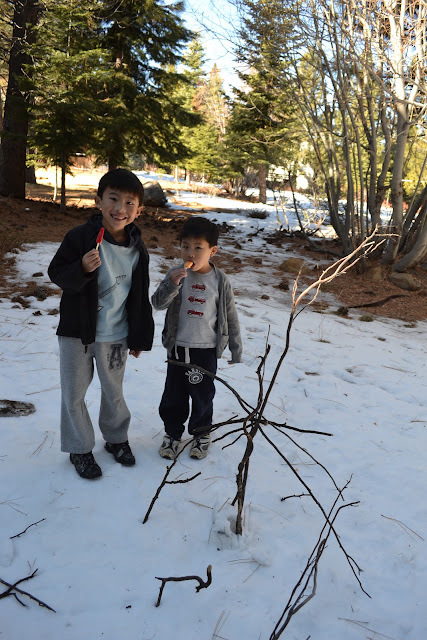 SO, I was searching for an art project that I could modify for all three kids (ages 2 through 7), and that didn't involve edibles (fantastic for class projects! 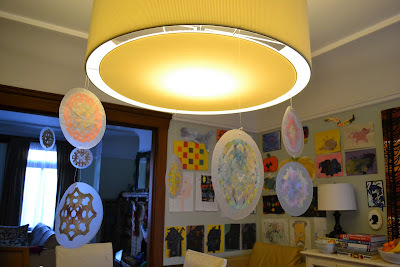 ), and found inspiration from various coffee filter snowflake projects. I picked up coffee filters at Target for a dollar, and since we already had the acrylics and glitter out from the dough ornaments, we just kept on crafting. 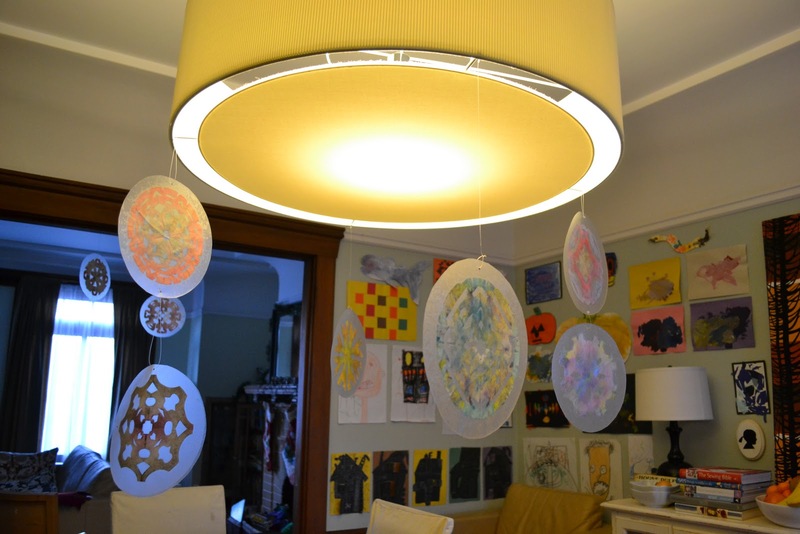 They're beautiful, kid-made, and the best part: the way their eyes light up when we open them up! Truly amazing and unique shapes! 1. 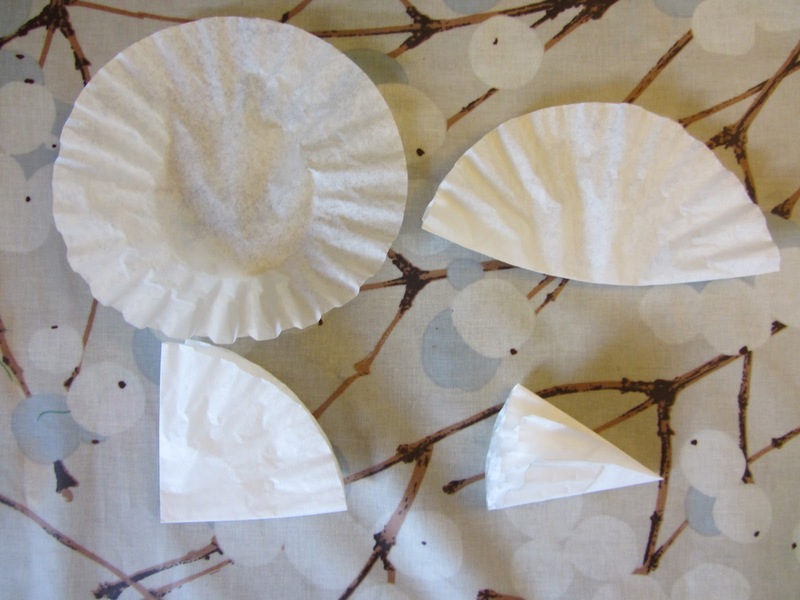 Fold the coffee filter in half three times, and cut shapes into the straight sides and rounded edge, making sure to keep part of the original fold intact on each side so the snowflake stays together. My almost five-year-old could do this, but I needed to cut for my two-year-old. 2. Dip your brush in water, then paint and start saturating the coffee filter. 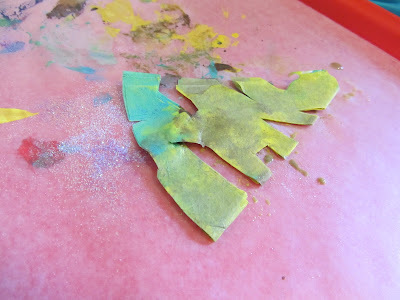 You want the paint to seep through all the layers, so you'll need lots and lots of paint and water (such fun!). 3. An adult should open it up (it's a bit delicate at this point) and lay it flat so you can apply glitter and dry on a rack. 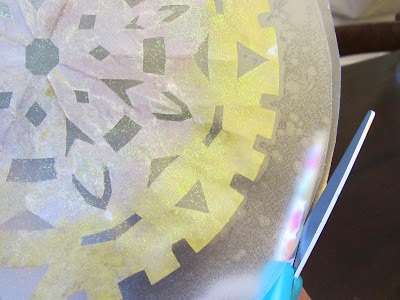 If you're not doing glitter or if you want to apply glitter later, you may leave them to dry still folded. 4. 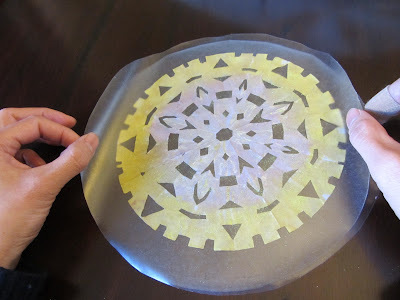 While your snowflakes are drying, find something round to trace around that is slightly bigger than the diameter of your snowflake (I found some salad plates that left about a 1 inch edge around my snowflake). Use your plate or other object to trace a circle on the paper side of the contact paper. 5. 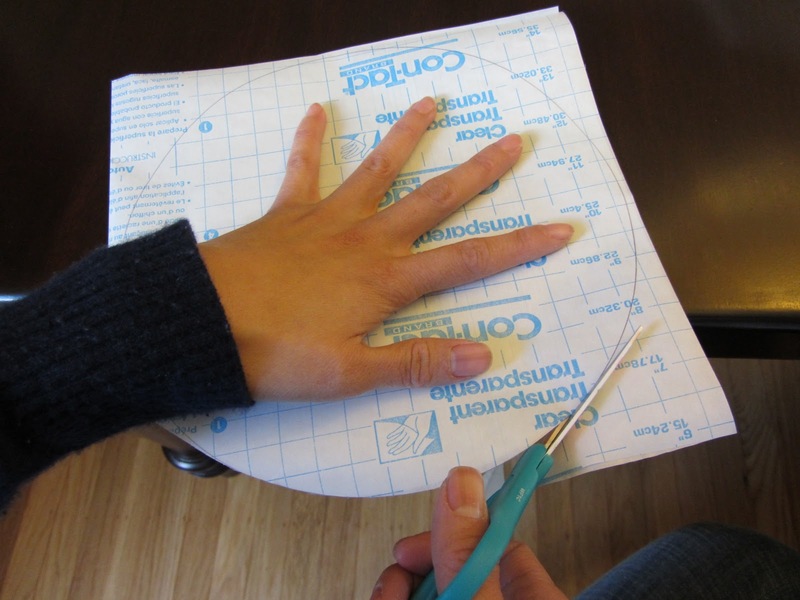 Fold the contact paper in half and cut out the circles through the two layers so that you have two identical circles. This could prove tricky because of the curly, slippery paper (it has been stored in a roll all this time after all). 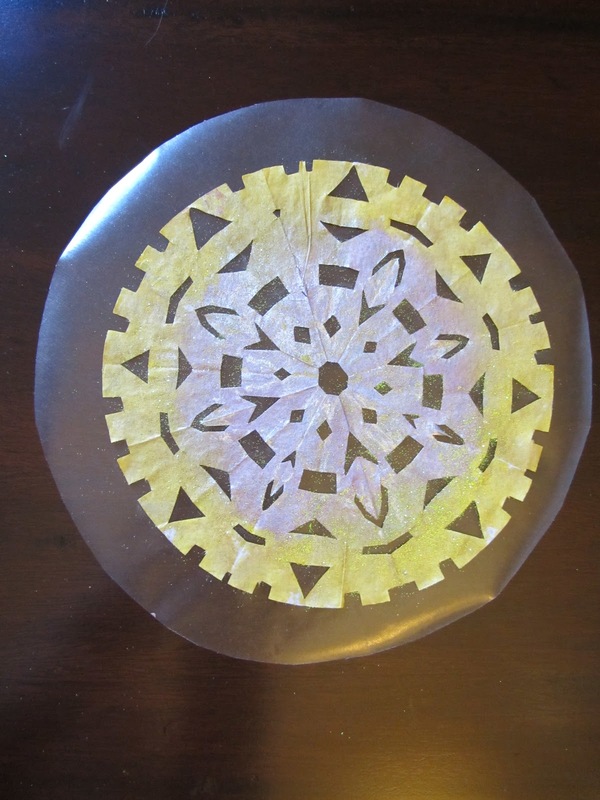 I found it helped to lay it flat on the table holding it down and flattening with my left hand, and cutting segment by segment off the table with my right. 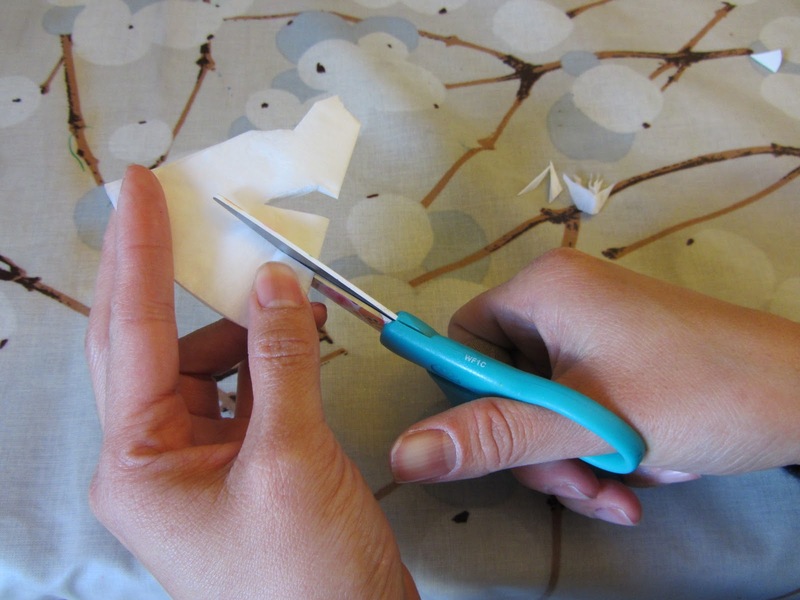 Continue rotating the contact paper and cutting until the folded part is cut off. 6. 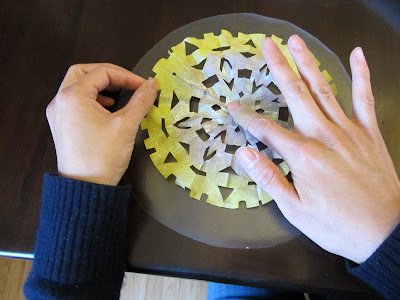 Once the snowflakes are dry, peel the backing off one of the circles, lay it on your table, and lay your snowflake on top gently, centering the center of the snowflake to the center of the circle as much as possible. 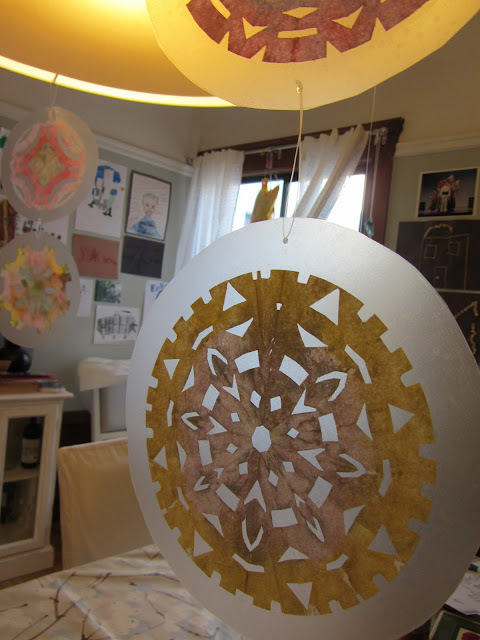 Flatten and smooth the snowflake starting at the center, and radiating out. 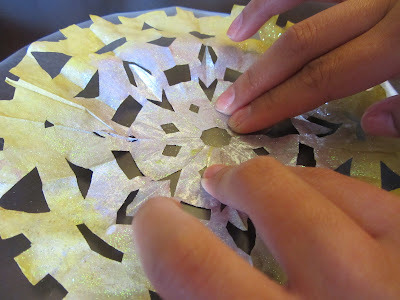 (If you haven't applied the glitter but still want to, sprinkle some onto your snowflake before the next step). 7. Peel the paper off the second circle, and float it over the first to align, and then bring two sides up gently. Lower the bend onto your snowflake, then drop the sides down. As you did with the snowflake, flatten and smooth the contact paper, starting at the center, and radiating out. 8. 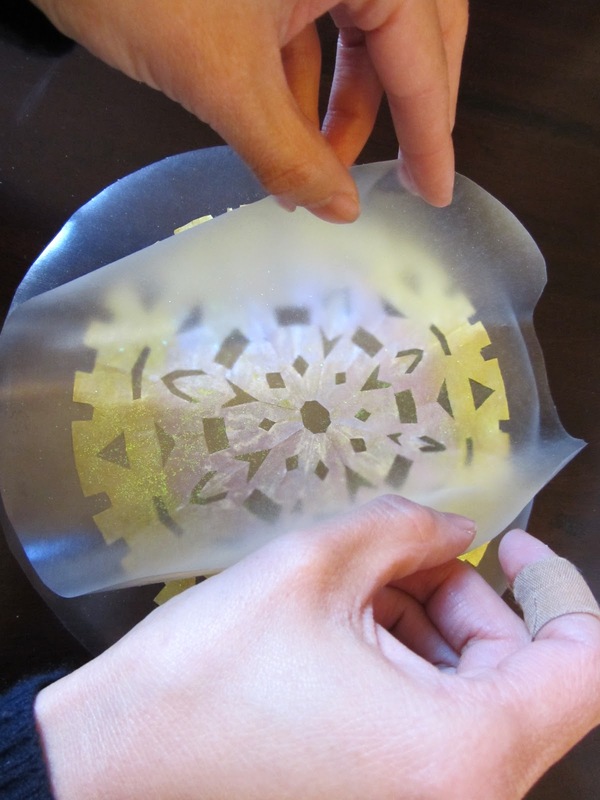 Trim excess contact paper off the edges. 9. 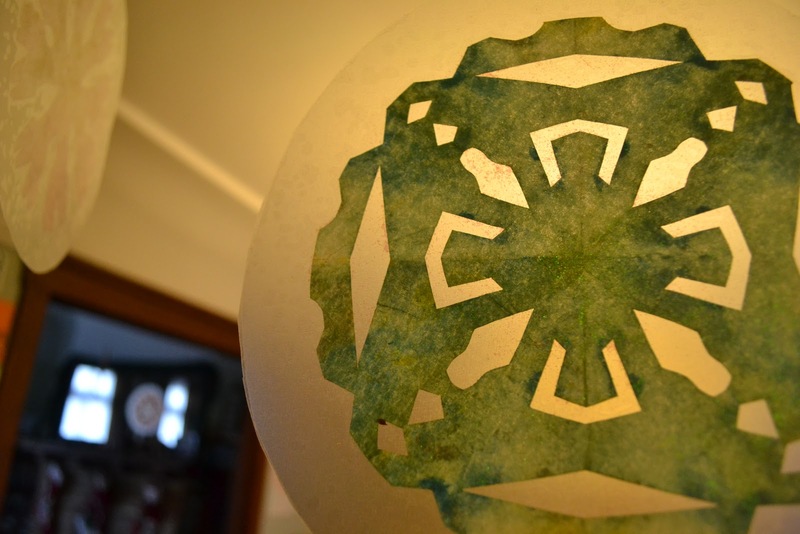 To hang, punch a hole toward the top (rotate the snowflake until you decide where you'd like the top to be), and string your ribbon or line through. You can string several together, or leave them on their own. 10. They would look beautiful on a window too. 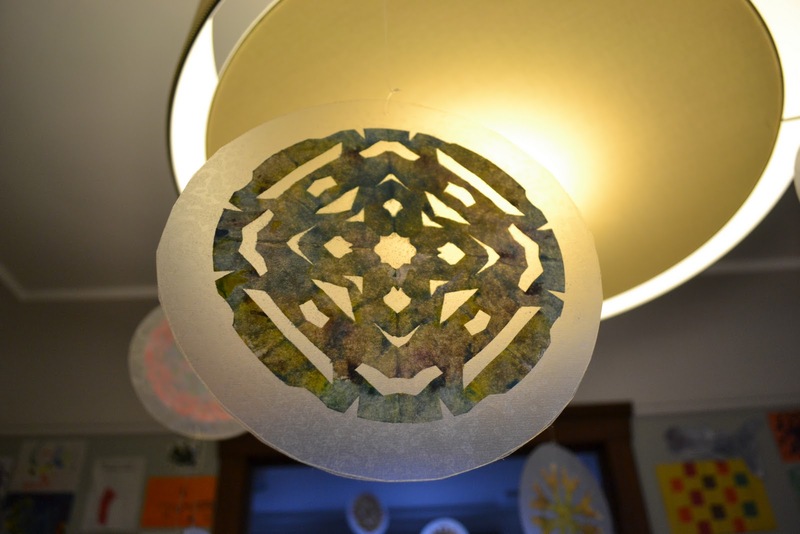 Just make one of the circles bigger than the first, so that there is a sticky perimeter, and stick directly onto your window.